First NEU Global Co-op participant joins AVC - Armenian Volunteer Corps - Come Move Mountains. AVC has a new partnership with Northeastern University (NEU) and their Global Co-op program. NEU Co-op students can now choose to do their co-op internship in Armenia through Armenian Volunteer Corps (AVC) and one of its 800+ placement partners. AVC welcomed our first NEU Global Co-op Program participant in July 2017. Chloe O’Malley is doing her Bachelor’s in International Affairs and Cultural Anthropology. Her interests are documentary film and sustainable development and she has done two previous global coops in these fields in the UK and in Costa Rica. About applying to AVC, Chloe says “I was excited by the range of opportunities I saw in the AVC posting to become involved in the filmography/photography process. Of them all, the most appealing option for me was definitely the internship at Bars Media Documentary Studio. This is because while I feel my skills in filming remain as of now at a basic level that I would much like the chance to improve upon, I also feel that I could play to my strengths – chiefly writing, editing and research – in this position or something similar“. 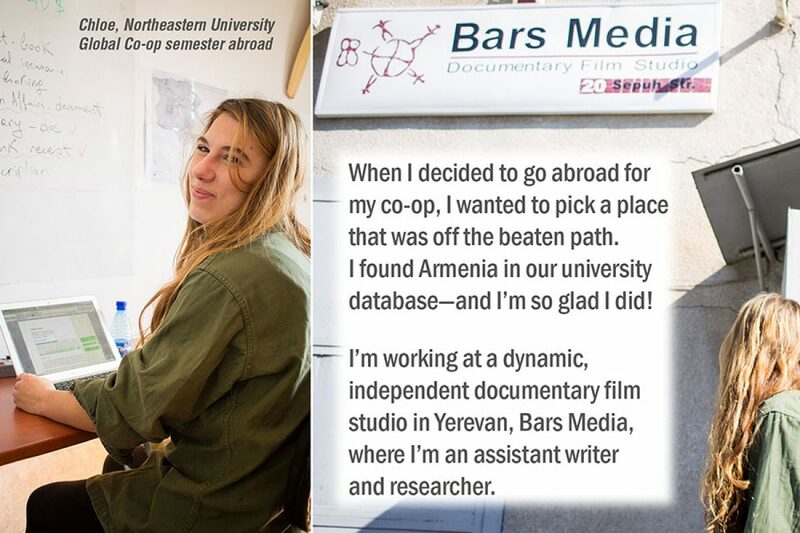 Chloe is currently working at Bars Media as an assistant writer and researcher — and where she’s helping to produce one of the most popular shows on Armenian television ‚Janapar‘.